Professor Pope uses the law both to improve medical decision-making and to protect patient rights at the end of life. He is working: (1) to balance liberty and public health, (2) to assure adequate informed consent, and (3) to develop fair internal dispute resolution mechanisms. Specific topics include medical futility, advance directives, ethics committees, and brain death. He explores these issues in nearly 200 publications in leading medical journals, law reviews, bar journals, nursing journals, bioethics journals, and book chapters. Professor Pope coauthors the definitive treatise The Right to Die: The Law of End-of-Life Decisionmaking, and he runs the Medical Futility Blog, which has nearly four million page views. Professor Pope’s engagement with health law and bioethics goes beyond academic scholarship. 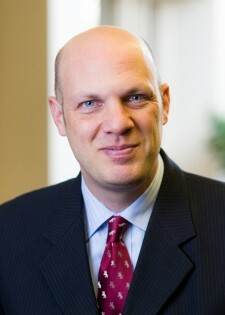 He bridges thought and action with amicus briefs, legislative testimony, and professional organization policy statements. Thaddeus Pope joined Hamline University School of Law (a predecessor school to Mitchell Hamline School of Law) as the director of the Health Law Institute in January 2012 after serving as associate professor of law at Widener University School of Law. There, his research focused on medical futility, internal dispute resolution, tort law, public health law, and normative jurisprudence. He authors a blog on medical futility, reporting and discussing legislative, judicial, regulatory, medical, and other developments concerning end-of-life medical treatment. Pope also taught at Albany Medical College and the University of Memphis. Prior to joining academia, he practiced at Arnold & Porter and clerked on the U.S. Court of Appeals for the Seventh Circuit. Pope earned a J.D. and Ph.D. in philosophy and bioethics from Georgetown University. Health Law, Bioethics, Torts, Medical Law at the End of Life.